Saaz is one of the noble hops (Hallertau, Tettnanger, Spalt, and Saaz) that helped change the world of brewing forever, named after the former Austrian city of Saaz (now in Czech Republic) it helped to define European Lagers and Bohemian Pilsners. Saaz is also grown in Belgium and the United States and has several descendants from New Zealand including Motueka and Riwaka. The alpha acid content is very low at 2.0%-6.0% making this variety very much for use as an aromatic agent in the beer. The alpha beta ratio is 1:1.5 which is higher than most varieties and is considered to give beer a more delicate bitterness. The aroma from saaz comes from its balanced oils, including a high level of farnesene and results in a seasoned herbal character. Saaz also has a higher content of polyphenols which subsides the oxidation and aging process in beer, giving it a longer shelf life. Saaz lacks both a strong yield as well as resistance to the crippling mildews. Maturity and Growth Habit are both mixed depending on where it is grown. And it produces small and light cones that can be difficult to harvest. 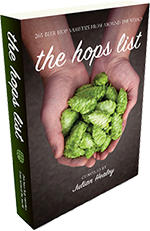 That has not slowed down its demand on the commercial markets, and is a staple to many breweries around the world.